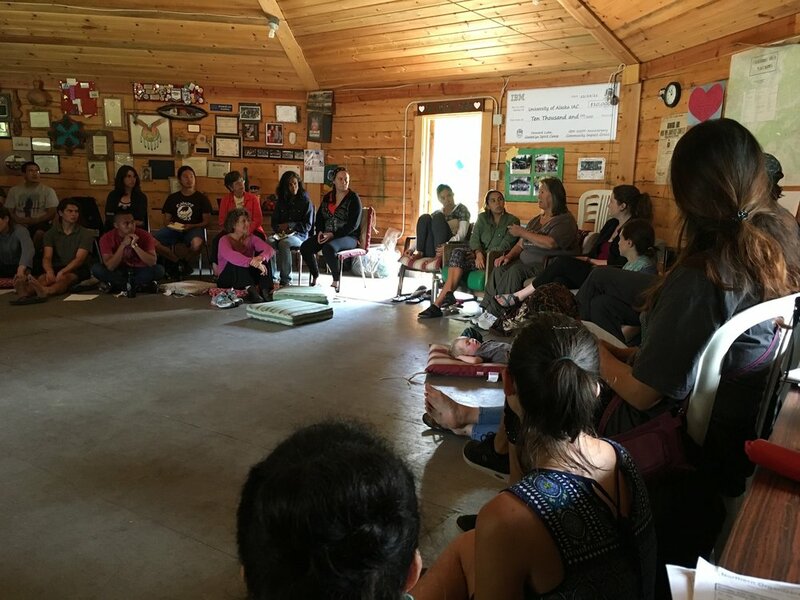 Our Indigenous Leadership work is comprised of various length trainings, workshops, and longer-formatted camps, all of which focus on building leadership rooted in responsibility to community and utilizing strategies grounded in Indigenous knowledge and decolonizing frameworks. Our trainings are not exclusive to Indigenous leaders, rather our leadership model is shaped from an Indigenous worldview and uplifting of place-based knowledge. We believe it is essential for community organizers and leaders to build culturally-based community organizing practices, root-cause analysis, intersectionality, and self-transformation. We strive to adhere to the traditional values of the peoples whose ancestral lands we are on as we move forward with our work for social justice. Additionally, understanding power and privilege structures of colonialism, institutional racism, class, gender, and political-economic systems are foundational for meaningful, healing, and long-lasting solutions to be implemented. We strive to build healing practices into our work and our lives. Listed are the sessions we have scheduled that are open to community advocates, some of these sessions may require you to submit a short application and small registration fee. All our trainings utilize a range of activities and discussions designed for participants from a diversity of ages and backgrounds. Listed below are brief descriptions of a few trainings we have hosted recently. All our trainings utilize a range of possible activities and discussions designed for participants from a diversity of ages and backgrounds. Untangling Colonialism -- Building a Decolonizing Framework. A decolonizing practice requires recognition of the history of colonization and its current manifestations. This training briefly covers United States Federal Indian Policy carried out dominantly in the lower 48 and its expansion into Alaska policy and the implications on Alaska Native peoples. Additionally, participants will discuss how the history of environmental conservation has mirrored colonial world-views and what possible strategies we can further in order to decolonize conservation. This training delves into the spectrum of decolonizing strategies; from various personal, institutional, and systemic pathways forward. Building People Powered Campaigns for Justice: This training goes through some of the basics of community organizing and how to build collective strategies that analyze community problems to find tangible solutions. This training can include vision and mission building, campaign planning, power mapping, SMARTI, base building, media tools, public speaking, and facilitation skill building. Indigenous Feminism & Gender Dialogue: This session connects patriarchy and colonialism as one of the means by which we understand Indigenous Feminism. We explore the harmful impacts of patriarchy and the many forms of feminism. We unpack modern LGBTQ and gender terminology; and we build discussions around Indigenous gender concepts. The goal of this session is to create a safe and empowering space to build greater understanding of gender, sexuality, and the many forms of feminism. Justice — Dismantling Oppressive Power & Privilege. Understanding unseen privileges and how that relates to power dynamics is critical to untangling and dismantling harmful systems of oppression. How is environmental justice different from environmentalism? How are Indigenous Peoples rights related to social justice? How does grassroots feminism relate to our work? What does building equity and alignment among allies look like and how can we more meaningfully build solidarity movements? We have hosted two annual camps at the Howard Luke Gaalee’ya center on the banks of the Tanana River outside of Fairbanks, AK. This past year's camp focused on Art in Action! Art can be both a reflection of the world surrounding and a critical tool for re-shaping worldview. As we work to build a better world, we must dig our hands and our hearts into the essential creation of art — Art that Reflects and Art that Reshapes! 40 Alaska community organizers, their children, and an amazing support team spent four days together at the beautiful Howard Luke Gaalee’ya center on the banks of the Tanana River outside of Fairbanks, AK. The camp is designed to be a healing space, grounded in Decolonizing & Just Transition frameworks. Additionally, participants choose from one of three art tracks: Visual Arts, Theater Arts, & Digital Arts. COMING SOON: Check out some of this year's Digital Arts short film creations! Thanks to photographer Keri Oberly for many of these photos! 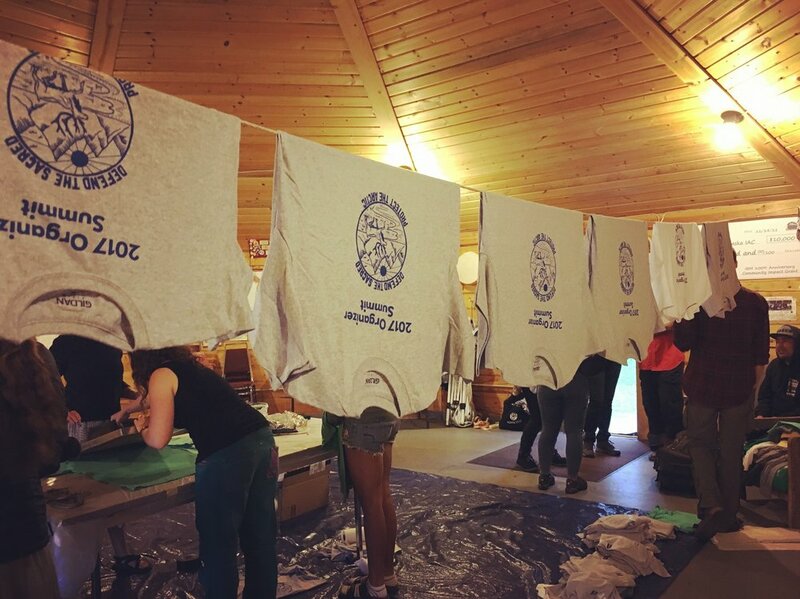 This camp was carried out in partnership with the Gwichin Steering Committee and the Fairbanks Climate Action Coalition, with training support from Movement Generation and IP3.